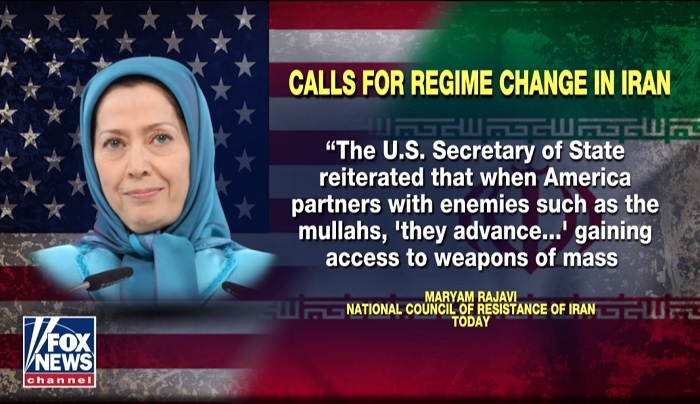 Fox news quoting Maryam Rajavi, leader of Iran opposition in response to recent remarks by Secretary Pompeo emphasizing an end to the U.S. policy of appeasement towards the mullahs in Iran. During coverage of US Secretary of State Mike Pompeo’s nine-nation tour of the Middle East, Fox News aired Pompeo’s speech he made on Friday, January 11th. In the speech, the Secretary of State denounced the Iranian regime’s “malign activity” as “creating enormous instability here in the region”. Pompeo announced that the US would arrange a world summit on Iran, to be held in Poland in February 2019, where the international community would explore avenues of curbing the regime’s influence in the region. Fox News interviewed Mark Dubowitz, CEO of the think-tank Foundation for Defense of Democracies, who spoke about his recent visit to the Middle East and meetings he had with top leaders in the region. 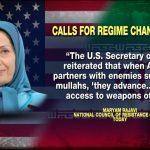 Fox News then aired footage of the People’s Mujahedin Organisation of Iran’s (MEK’s) annual Grand Gathering, held outside Paris. Eric Shawn, the Fox News host, described how the Iranian regime had plotted to bomb the event, attended by more than 100,000 MEK supporters and allies from across the world. Shawn pointed out that among those in attendance were several former US officials, including Trump’s lawyer and former New York mayor, Rudy Giuliani, who, Shawn said, “speak every year,” at the event.